One question interviewer Amy Brady poses: What can fiction teach about climate change that scientific reports cannot? Climate change communication efforts are more important than ever, and the artists and writers I profile here are taking part in those efforts. 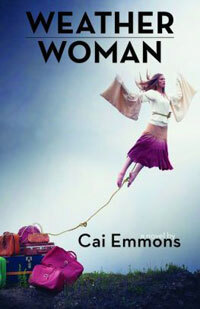 Novelist Cai Emmons’ novel Weather Woman hit shelves in October. It follows the story of 30-year-old Bronwyn, who drops out of her doctoral program and takes a job as a TV meteorologist. After being dumped by her boyfriend, she discovers that she has the ability to affect the weather. Weather Woman is a beautifully written and deeply engaging novel that had me hooked from page one. Amy Brady: Your novel has a fantastical element in that the protagonist, Bronwyn Artair, can directly affect the weather. But the novel is also rooted in reality with its references to climate-related phenomena like wild fires, extreme weather patterns, and the effects of Siberian methane field emissions on the atmosphere. What inspired such a rich and interesting story? Cai Emmons: A novel idea crystallizes for me when two persistent thoughts dovetail. Since I was a small child in New England, I have always been fascinated by weather, extreme weather in particular. On many occasions I have wanted fervently to change the weather, to favor activities like swimming or trick-or-treating. As an adult, when I awoke to a downpour on my wedding day I desperately wanted to stop it. This idea connected with one of my favorite books as a child, Oliver Butterworth’s The Trouble with Jenny’s Ear, in which a young girl realizes she can read people’s thoughts. At some point along the way a what-if sprang up in my mind: What if a person really could change the weather? That premise led to a consideration of what such a person could do in terms of changing the climate. Amy Brady: Are you concerned about climate issues beyond what you write about in your fiction? Cai Emmons: Perhaps because of having been attuned to the weather, I have been obsessed with climate change for years. To my mind the warming planet presents an enormous threat to human survival, particularly because it gives rise to a host of other life-threatening circumstances such as drought, fires, floods, famine, disease, mass migration, war, etc. It is incomprehensible to me that this threat has not given rise to hysteria and a massive remedial effort in response. I am interested in the work of sociologist Kari Norgaard who has attempted to understand the general malaise regarding climate change, especially among people who acknowledge both that it is happening and that it is human-caused. Amy Brady: Weather Woman brushes up against how climate change is addressed (or not) in the press, both in the character of tabloid journalist Matt and Bronwyn’s own experiences. The question of how the American press in particular reports on climate change haunted me as I read. What are your thoughts on the subject? Cai Emmons: I have read some excellent coverage of the climate crisis in The New York Times and The New Yorker, along with various other publications (The Washington Post, National Geographic, etc.). Some of these articles have been very informative, others have been deeply alarming. But I am always acutely aware of the limitations of journalism in a culture that is so heavily polarized as ours now is. I may be drawn to every article I see about the unfolding climate disaster, but are these articles reaching people who know nothing about how dire the situation is, or those who actively oppose the idea that a problem exists. I doubt it. Amy Brady: In some ways, Weather Woman is about personal responsibility. Bronwyn has the supernatural power to affect the weather, but looked at a different way, so do we all. Climate change has been brought about because of anthropogenic activity, and we’ve only begun to see the effects of that activity. The presence of this theme suggests that this is something you’ve thought a lot about. Would you discuss your artistic process for coming up with this theme and how you teased it out? Cai Emmons: I think a lot about what the path forward is in addressing climate change. I see the U.S. as deeply crippled by the cultural attitude that prizes individual rights over the needs of the community. This prevailing ethos means that we tend to view solutions to climate change in individual terms. I live in a small liberal Oregon city whose residents (many of them) pride themselves on being good custodians of the Earth. People here recycle, drive hybrid cars, ride bikes, eschew meat. This is all laudable, and it makes people feel good about themselves, but the impact is minor and does not address the problem head-on. We need large-scale collective action to change laws, regulate emissions, ban human practices that are deleterious to the environment. Only when we act together will our actions be consequential. Amy Brady: Throughout the book Bronwyn has to deal with skeptics. How do you deal with skeptics? Cai Emmons: Skeptics, OMG! This was actually a fun element for me to work with as a novelist, particularly in terms of who was going to believe in Bronwyn’s power. She is aware of moving in a world in which she is unlikely to be believed. A few characters like Nicole and Earl believe in her power immediately, but others – most notably her mentor, Diane – are hard to convince, even after they’ve seen her at work. I wanted to feature diverse reactions to make readers wonder how they would be likely to react. Amy Brady: What do you think fiction can show or teach us about climate change that, say, scientific reports cannot? Cai Emmons: I think novels can be stealthy in a way that it is hard for journalistic or scientific work to be. The questions a novel raises piggyback on the lives of characters with problems and emotions readers recognize and participate in. If we, as readers, have stepped into the shoes of a character we can often embrace experiences and feelings, and even thoughts and opinions, that are antithetical to our own. I think most of us have had the experience of discovering a friend thinks differently about something than we do. Usually, rather than dropping the friend, we reevaluate our own position. Novels can, at their best, have the same impact. Weather Woman, by Cai Emmons, Red Hen Press, October 2018, $15.26 paperback. This article is part of the Climate Art Interviews series. It was originally published in Amy Brady’s “Burning Worlds” newsletter. Reprinted with permission of Amy Brady and Chicago Review of Books, a Yale Climate Connections content-sharing partner.